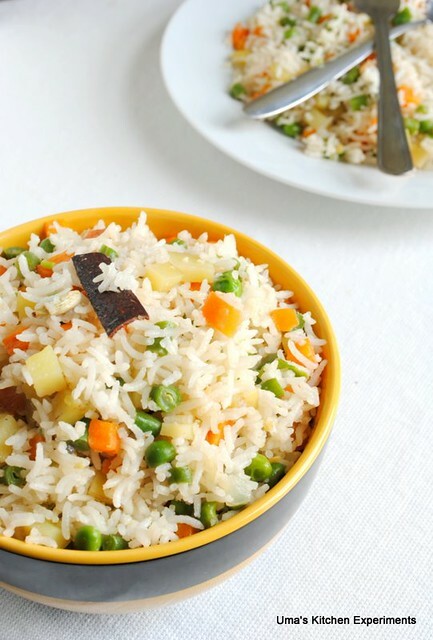 I am back with delicious vegetable pulao. 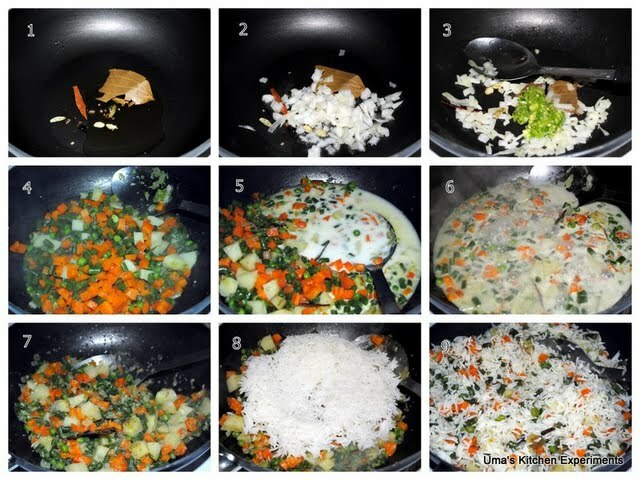 Somehow I have managed today to post "Vegetable Pulao" to wake up my blog. I find some unknown happiness when I write this post after a long time. I missed you my dear Bloggie. Forget to mention, It was truly a visual treat to see bunch of recipes which I missed for the past one week from my dear blogger friends. I missed your yummy recipes too. Does anyone know the difference between pulao and biryani? This question always arise whenever I prepare vegetable pulao. Searched on web and I was not satisfied with the results given by it. However, I would like to mention here few with my little knowledge. Biryani is prepared as one pot meal and coated with all kind of spices and vegetables whereas Pulao is not coated and most of the time it is prepared by assembling rice with vegetables. It uses only the aromatic spices and also One cannot eat pulao without any accompaniment. But biryani is most of the time served as a complete meal which can also be eaten without any accompaniment. 1) Wash rice well till the water gets clear and boil it by adding 1 and 3/4 cups of water. 2) Meanwhile, take a wide pan and heat oil in it. Add crushed cardamom, cloves, cinnamon stick and bay leaves. 3) When they change in color, add onion and saute till they are translucent. 4) Add minced ginger, garlic and green chillies. Saute for few seconds. 5) Add vegetables given and add salt. 6) Then add coconut milk and cook vegetables. If required add little water. 7) When the coconut milk absorbed by vegetables and they are well cooked, add the boiled rice. 8) Turn the flame to low and gently mix rice with vegetables. 9) Serve hot with any curry. Yummy pupal and nice picture! Uma, pulao looks so tempting and delicious. Delicious looking and colorful veg pulao dear. wow awesome pulav...u knw what I too made this today! Wow yummy pulao too good perfectly clicked!! Yummy and delicious pulao...had it for lunch just now.. COmforting meal and a filling one..love the clicks..
Yummy, inviting & colorful pulao!!! How I differentiate b/w pulao & biryani..Pulao is usually simple, made with few whole spices, onion and does have much masala..Most are served along with curries or dals as the rice is mild.Biryani on the other hand has ground masalas in it..usually cooked in layers and a meal by itself.. Thanks Prathima for the simple and sharp differentiation. You are very correct. Vegetable pulao looks absolutely delicious, so colourful..lovely clicks..